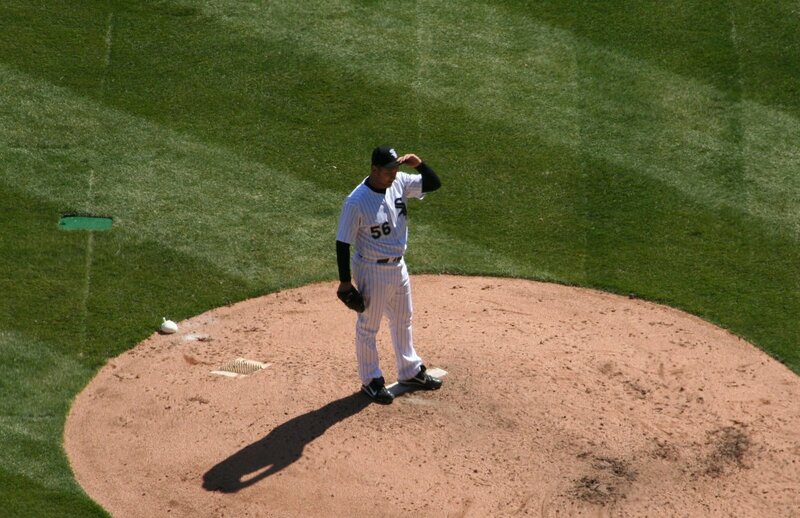 Mark Buehrle will be appearing in the record books once again af ter his performance tonight. As of right now he has retired the last 45 batters he has faced. That bests the record of 41 set by Bobby Jenks and Jim Barr. The funny thing is right now I just wish Jenks could get three straight batters out in an inning. Once again Mark was reminded what was going on by A.J. between innings. You could see him pointing towards the scoreboard, and I swear I read no-hitter on his lips. I was kidding around tonight while eating dinner that he could get his name alongside Johnny Van de Meer for tossing consecutive no-hitters. Who knew he would get this close? I had better get back to watching the game now. C’Mon Buehrle! Edit: As soon as I hit send Mark walked a batter, and then immediately gave up a base hit to Denard Span. No matter what he has shown that he is the Ace of this staff, and maybe some people around the country will know Mark Buehrle’s name. He was already one of my all time favorite Sox players dating back to his tarp diving days, but he now is right up there among my favorite. I was not at either no-hitter, but I was present for his last tarp dive. Those events are pretty close aren’t they? Posted in Chicago White Sox, Major League Baseball. The Brian Anderson Experiment is Ova! Since 2006 I have been pulling for Brian Anderson to do well. He has sh own flashes of brilliance, but has never really reached the potential that we all thought that he would. They have given him several chances, the longest in 2006, but he has never taken hold of the center field job. When he was sent back down to Charlotte last week he demanded a trade. Apparently he no longer wanted to be a member of the Chicago White Sox. Today the White Sox officially ended that phase of his career by trading him to the Boston Red Sox. In return they recieved Mark Kotsay. Kotsay is an outfielder who can play a little first base. They also received cash considerations. Brian brought us a decent player and cash? Good for him. When Mark joins the team you will have to wonder who will be left off the Sox roster? Will Dewayne Wise the hero of the Buehrle perfect game be sent down? He has no options left, and could be taken by another team. Will the unsung hero of the same game Josh Fields be sent down. He seems more likely since Kotsay can spell Pauly at first, and play the outfield. Wise is also a favorite of Ozzie’s to pinch run so that may save him. Tomorrow should be an interesting day. Either way Brian has changed his Sox, and I wish him the best of luck. I hope that he pans out to be the player I have always thought that he could be. I think the change of scenery could be just what he needs. He just better take it easy on us when we play the Red Sox from now on. I wonder what song they will play for him when he steps up to the plate in September? Posted in Boston Red Sox, Chicago White Sox, Major League Baseball. After missing a few years I finally made it back to ORP last night. Actually I made it back during the day. We decided to skip the first two practice sessions which were delayed by rain anyway. We got to the track in time to see the cars qualify. It is always fun to see true professionals take on the track. By shear luck we sat in front of former LaPorte resident Tony Raines‘ pit. He was the last car to go through tech inspection before qualifying so we got to see them wrench on his car for a while. As I said in the previous post Tony does not have the car under him to make noise so I was not too upset with his 21st spot after qualifying. 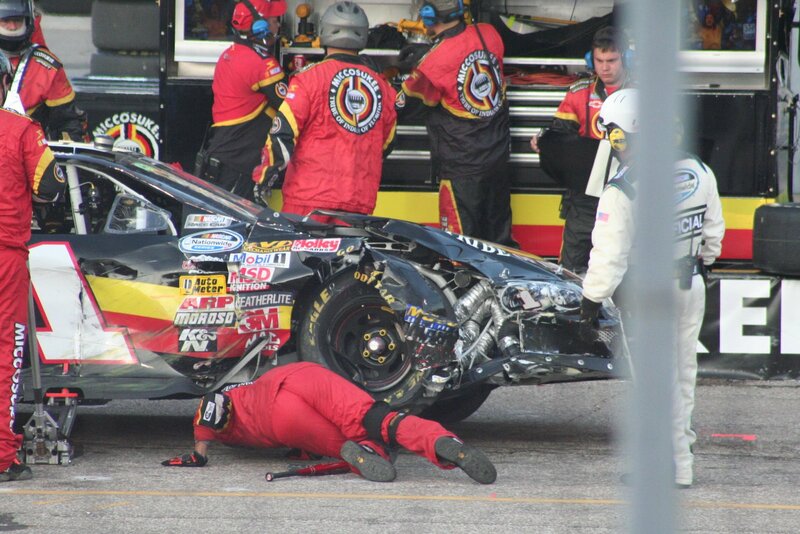 He ended up finishing 15th the first car a lap down. He is a good racer that is just not getting his chance. Sadly though his age may prevent him fro m ever getting that chance. The race was full of carnage, and I included a couple of pics of the end result. Kyle Busch blazed through the pack along with Carl Edwards and Matt Kenseth to displace the Nationwide regulars. Busch ended up collecting his 17th top ten of the season, and has a huge points lead. Matt Kensenth had not raced at ORP in ten years, and managed a third place finish. Crazy Carl Edwards won the race which was disappointing to me, but some people will be happy with that. We were sitting near the start finish line in some great seats that we got at the window just before qualifying. 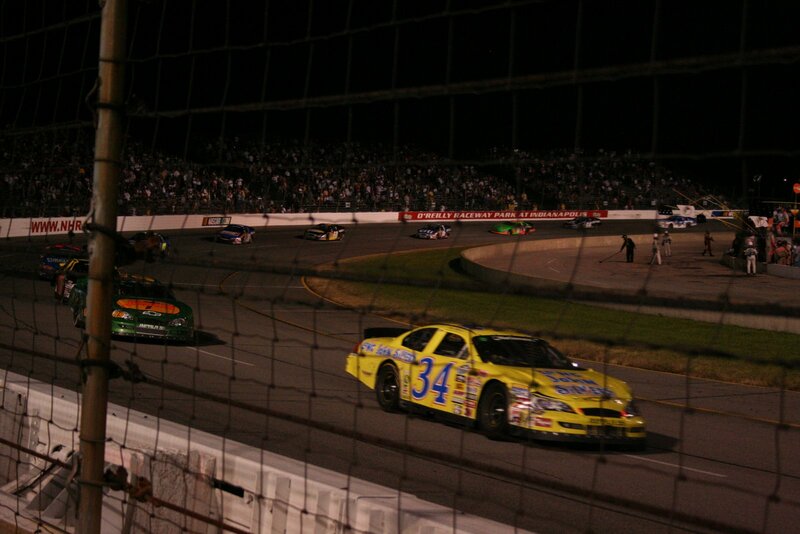 The last few laps we moved down to turn four, and stood against the fence. Although I still have not regained my sense of hearing it was a blast. The rest of the night was spent using hand signals. We had so much fun that we decided to start doing this every year. Maybe I will be able to hear by then. On a sidenote apparently the male enhancement pill Extendze has a car in the Nationwide Series. They have a booth at the track where they will give away pills and t-shirts to anybody. I mean anyone. I saw some kids under ten wearing the shirts and holding the pills in their hands. Do we need this at the track? Parents now will have to explain to their kids what the pills do at an age that maybe they should not have to. With the economy the way that it is though I guess you have to take whatever sponsor will get your team up and racing. You want your team to grow bigger, and you will do whatever it takes to make it so. To the left is another fan who had a great shirt. He was down with us at the end of the race, and made it a little more exciting. 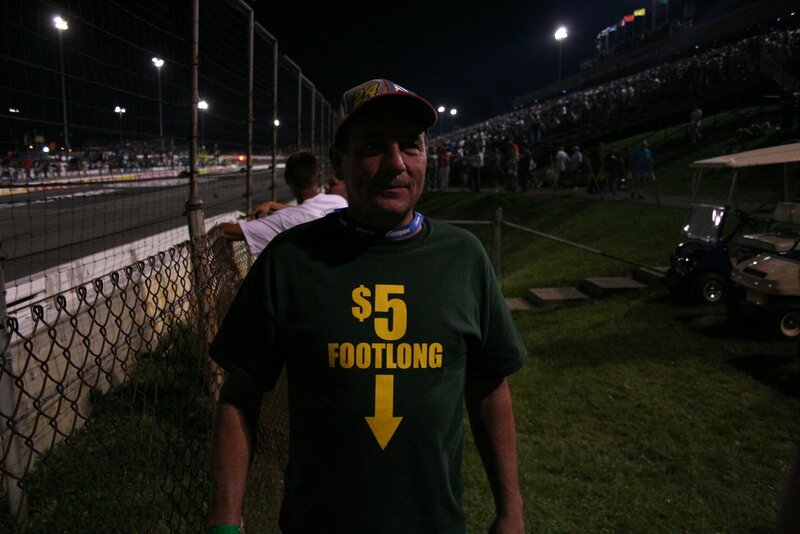 This man really loves his NASCAR. He said his kids got him the shirt. Good present kids! 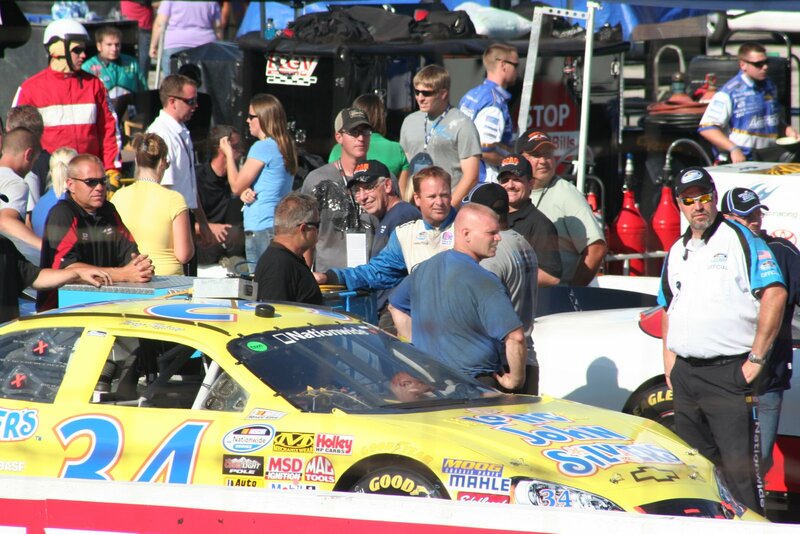 Posted in NASCAR, Tony Raines. Today I am headed to Indy to watch the Nationwide Series Race at ORP. This will be my first time at ORP, but I was at the track three times when it was called IRP. This is a fun track that does not bankrupt you to see a race. 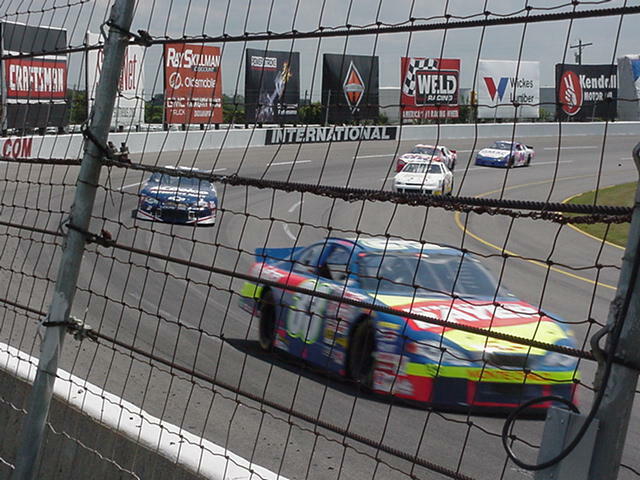 The picture to the left is from my first time at the track in 2000. Tony Raines a local racer from LaPorte is being trailed by Kevin Harvick in practice. The cars will be on the track right now for practice. They will take a 1/2 hour off before entering the track again for their final practice. My brother and I plan on getting there for qualifying, and of course staying for the race. This is a flat track that makes qualifying very important. Tony Raines the local boy has been struggling this year as his team really does not have the horses to compete with the big boys. He is a good driver though, and will usually bring his car home safe. At a short track that can mean a good finish. Maybe he will pull off the upset tonight. 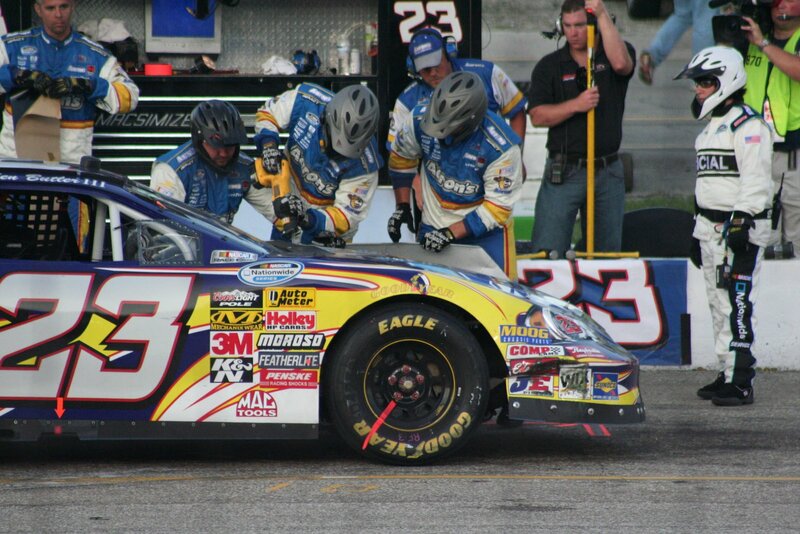 Ron Hornaday is stepping in for a race in the Kevin Harvick owned #33, and I would tab him as my favorite. He has the car, and really nothing to lose as far as points are concerned. He also won the Truck race at ORP last night. Kyle Busch can never be counted out as well. Busch finished tenth in last nights truck race, and will have a busy day going from the Brickyard back to ORP all day long. Two former Tigers highlight the appearances this week. The jerseys and bobble’s also seem to be reving up. This is the time of year they want you at the park. Peoria Chiefs – Bill Murray night. The club will celebrate the movies of Bill Murray throughout the night. Great Lakes Loons – Milt Wilcox appearance. Great Lakes Loons – Jimmy Buffet night with a Buffet impersonator. Birmingham Barons – Football jersey night. Wear a football jersey to the baseball game to get a discounted ticket. Memphis Redbirds – Memphis wrestling night. A ring will be set up and former wrestlers will give it a go once again. Jerry “the King” Lawler among those scheduled to attend. Posted in This Week's Promotions. Today Mark Buehrle did the unthinkable. He pitched a perfect g ame. Mark is a great pitcher, but he would be the first to tell you that he does not have overpowering stuff. Apparently it is pretty good stuff though. This is his second no-hitter in three years. The first was broken up when Sammy Sosa got on base. Mark quickly picked off Sammy so he would only face the minimum that day. I have not seen the entire game yet, but I will be watching the replay tonight on Comcast Sports Net. From what I have seen in replays the defense really helped him out. Dewayne Wise came in for his defense, and made a great catch that made that decision look genius. I don’t think that Scotty Pods has the wall presence to make that catch. I am not a huge Wise fan, but I will give him a pass today. Alexei once again made some good plays at short. He really has gotten a bad rap over at short. Hawk may have to sit out tomorrow’s doubleheader and let his vocal chords rest. He has really been getting into the Sox games lately. He feels like most Sox fans do. We know that now is the time. Another Sox fan Barack Obama called to congratulate Buehrle who took it in stride like he does everything else. Mark is fun to watch, and will probably always be one of my favorite Sox players of all time. I think we need to start getting the spot for his monument in the outfield ready. Mark is the 18th pitcher in Major League history to pitch a perfect game. The perfect game along with a previous no-hitter puts Mark into some great company. Here are the other pitchers to accomplish the same feat: Cy Young, Adie Joss, Jim Bunning, Sandy Koufax, and Randy Johnson. That is a pretty good rotation there. Now you can add Mark to the list. Here are some other interesting facts about Mark’s game today. Eric Cooper was behind the plate for both of Mark’s no hitters. As you know all umpires have numbers, and Eric’s is #56. Mark is well known for his quick pitching, but both of his no hitters took the same time to complete. The most important fact about the game is that it put the Sox into a virtual tie for first place with the Detroit Tigers who we face starting tomorrow in a four game three day series. This should be sufficient momentum going into that series. Posted in Chicago White Sox, Major League Baseball, Tampa Bay Rays.